Green policy – a new rift in the coalition? Yesterday the Guardian and the Telegraph reported that Energy Secretary Chris Huhne has attacked the Conservatives on environmental policy, accusing them of being ‘rightwing idealogues’ and ‘deregulation zealots’. 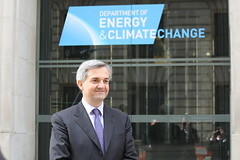 Huhne’s anger was sparked by a government review of red tape, which suggested that several environmental laws (including the Climate Change Act) should be scrapped. It is rumoured that other senior Liberal Democrats (including Business Secretary Vince Cable) agree with Huhne. Given David Cameron’s conversion to environmentalism, one might expect the Conservatives to be supportive of green policies. However, on this subject the Conservatives’ traditional hostility to state regulation seems to be re-asserting itself. It could be argued that the Tories’ enthusiasm for green values was never genuine in the first place, with Cameron’s conversion being a mere cosmetic exercise which was part of an attempt to shed the Tories’ image as the ‘nasty party’. The New Statesman suggests that the attack by Huhne is an attempt to strengthen his position within the Lib Dems. This indicates that Huhne, who lost to Nick Clegg in the last Lib Dem leadership race, is still thinking about the possibility of unseating Clegg and becoming leader himself. This raises the question of how long the coalition will last, as the one event which is most likely to lead to Clegg’s resignation is that of the party leaving the coalition. The AV referendum could have caused this, with the victory of the No campaign representing a bitter defeat both for the party and for Clegg himself. But instead of leaving the coalition, Clegg fought back, announcing that he would use ‘muscular liberalism’ to ensure a greater role for the Lib Dems in shaping government policy. He appears to have succeeded in watering down Andrew Lansley’s proposed changes to the NHS. Then again, the government’s backtracking over NHS reform might have had more to do with opposition from healthcare professionals within the NHS than with any input from the Lib Dems. The government does not appear to be close to a breaking point in the near future, but this whole affair emphasizes how fragile the coalition is.